WesTech engineers water and wastewater process solutions for the power industry including water pretreatment, cooling tower makeup water treatment, and ultrafiltration pretreatment to reverse osmosis, guaranteeing SDIs less than 3. ISO 9001:2015 certified and turnkey experienced, WesTech stands ready to meet deadlines and assure minimal downtime with focused service. Power-generating stations, like other industrial wastewater producers, are facing stricter discharge requirements. 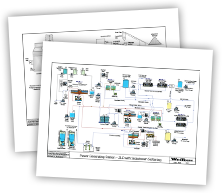 This flow sheet combines many of the water treatment steps that might be encountered in converting a power station into a zero liquid discharge (ZLD) system. In this system, the final waste stream is sent to a spray dryer. This flow sheet is a combination of several other flow sheets. The first section where the raw water enters is the service water pretreatment. The service water can be used for general water needs in the plant. The next section is demineralization for boiler feed water. The final section is the zero liquid discharge system that treats a slip stream from the cooling tower. In the first stage of treatment the raw water is softened to reduce the calcium and magnesium hardness (for more information on softening see the Cold Lime Softening flow sheet). Some of the softened water is diverted to the cooling tower. After recarbonation, the treated water is collected in the service water storage tank. Some of the service water is sent to the demineralizer system. The rest of the water is used for backwashing filters. The softening system includes a sludge dewatering step that is common to the entire plant. The thickener overflow is sent to the clarifier. The belt press pressate and wash water are returned to the thickener. The softened water passes through two stages of reverse osmosis (RO) to remove the bulk of the minerals. The RO reject is sent to the ZLD system. The electrodeionization (EDI) system makes high purity water by polishing the trace contaminants left after reverse osmosis using electricity instead of chemicals. The cooling tower slip stream treatment system is nearly identical to the ZLD flow sheet (a more detailed description of the process can be found on the Cold Lime Softening flow sheet). In this case, the clarifier is not used for cold lime softening, but it could be. The ZLD system shares the sludge dewatering facilities with the service water pretreatment system. The water is clarified, filtered, and treated with reverse osmosis. The reject from the boiler feed water system may be added to the clarifier or sent to the drying system depending on the chemistry of the water. The reverse osmosis concentrate is treated with a spray dryer and the dry solids are sent to a landfill. If the concentrate stream is too large for a spray dryer, the wastewater may be sent to drying beds in areas where the evaporation rate is greater than nominal rainfall, or to an evaporator/ crystallizer system. The roots of modern coal gasification date back to 1920s Germany where Franz Fischer pioneered the first of what would later be called the Fischer- Tropsch reactions. The Fischer-Tropsch process transforms coal into liquid fuels, including automobile fuel. Sources of feed product may vary and include coal, petroleum coke, tar sands, and biomass. Fischer-Tropsch converts the fuel to a gaseous phase at high temperature and pressure in the presence of oxygen. Hot slag (unburned material) is produced and quenched in water prior to disposal. The “black water” from this quenching process is then treated to remove residual solids and other contaminants prior to reuse. From the gasifier the hot slag passes through a lock hopper mechanism which liberates hydrogen gas while converting paraffin and naphthenes into aromatics and isomers. Quench tank slurry flows to a tank with a drag conveyor which moves the large chunks of slag. Residual water and solids then flow over vibrating screens for further solids removal. The slag from these two steps is then discarded or sold. The vibrating screen effluent is fed back to the settler prior to recirculation. The stream containing the fine solids from the settler feed tank is treated with a polymer prior to entering the settler. The settler feedwell houses the flocculation mechanism which turns at slow speed, imparting enough energy to facilitate floc formation and rapid settling. The settler tank is covered and insulated to maintain constant temperature. This minimizes temperature differentials between the tank walls and interior which cause unwanted mixing currents that inhibit proper settling. The rake drive for this unit is equipped with a lift mechanism. This lift raises the entire mechanism off the tank bottom if the torque increases. Typical lift is two feet in one-foot increments at preset torque limits. Should this occur, an alarm sounds and a light flashes during each lift sequence. If the increased torque persists, a final alarm is sounded and the mechanism is automatically shut down. Correction of the cause then allows an operator to restart the mechanism. The settler performs three processes in one: it flocculates, clarifies, and thickens in a combined single process step. Underflow solids from the settler are gravity-fed to a mix tank where polymer is added. The slurry is then allowed to overflow the mix tank to a rotary vacuum drum filter. Feeding the slurry through a trough eliminates the need for pumping and the possibility of pulp plugging a feed pipe. This gentle handling of the solids allows them to be more easily dewatered on the vacuum filter. The dewatered solids are then collected for disposal. Settler effluent may require oxidation to strip organics or other contaminants. If oxidation is not required, the grey water tank serves as a collection tank settler overflow. In either case, the water is recycled to a variety of steps, including quench water and syngas scrubber feed. Flue gas desulfurization removes sulfur dioxide from fossil fuel flue gases. Wet-scrubbing transfers the pollutants to a liquid which is treated before waterway discharge. The scrubbing solution is usually lime and a concentrated solution of calcium sulfate is produced. Blowdown is required to keep the solution below saturation so that scaling does not occur. Desaturating the stream of metals and gypsum is important to prevent scaling on equipment and is performed by dilution and lowering the temperature (remember that calcium salts are inversely soluble). The pH of the wastewater stream is then raised to between 8-10 using calcium hydroxide (Ca(OH)2) or sodium hydroxide (NaOH). Dissolved metals form hydroxides which precipitate as solids. The lime or caustic is added to precipitate gypsum from the stream. Sludge is recycled from the downstream clarifier to provide seed for gypsum crystallization. Some heavy metals are removed as hydroxides as pH is raised. Small waste stream pH adjustment is normally accomplished through caustic addition rather than lime slurry. The use of caustic saves capital costs and reduces sludge production. Organosulfides or sodium sulfides may be added to further precipitate heavy metals. Metal sulfides have much lower solubility than metal hydroxides. These compounds are also very effective in removing mercury down to parts per trillion levels. Ferric chloride is added to neutralize charged particles, allowing flocs to form and enhancing clarifier performance. This may also precipitate other metals and organic matter. Polymer addition aids in larger floc formation, further enhancing clarifier performance. The wastewater is clarified by a WesTech Flocculating Clarifier. A rake lift is provided since inlet solids can be as high as 2%. The pH is adjusted to normal using hydrochloric acid (HCl). HCl is used because no additional sulfate needs to be added. The metal precipitates must now be removed from the waste stream. Since there is a relatively low amount of solids, it is necessary to use a Solids CONTACT CLARIFIER™ for this purpose. The Solids CONTACT CLARIFIER™ has an impeller-driven sludge recycle stream. This draws sludge from the tank bottom through a draft tube into the reaction well. This impeller acts as a high flow, low shear pump. The recycle stream is sized to 10 times the inlet flow and has suspended solids of 10,000 ppm. Incoming particles contact previously flocculated solids, yielding high removal rates. Blowdown sludge from the Solids CONTACT CLARIFIER™ is recycled to a mix tank in the feed stream. This promotes additional floc formation and solids removal. Gravity media filtration may be used if a low suspended solids level is required prior to wastewater discharge. In this case, filter backwash is returned to the front of the wastewater treatment system. The clarifier sludge typically contains 3-5 weight percent of solids. This contains inert material and precipitated metals which are pumped to a thickener to increase the solids percentage. Volume dewatering requirements determine the choice of recessed chamber filter presses or belt presses. Sulfur in the coal is converted to sulfur dioxide (SO2) when the coal is burned. If the SO2 is left in the stack gas, it will react with water in the air to form sulfuric acid. This acid is the main cause of acid rain. Sulfur removal from the stack gases has been required since the late 1970s. Scrubbers are one way to remove the sulfur from the stack gas. The dual alkali design of scrubbing flue gas has been widely used since the early 1980s. As the name implies, two alkalis (sodium and calcium) are used to capture sulfur dioxide (SO2). This employs an indirect lime process for removing acid from the gas with a sodium-based absorbent. The sorbent liquor is regenerated with a zero liquid discharge (ZLD) system and is recycled back to the scrubber. Depending on the size of the system, the sodium-based absorbent is most commonly either caustic (NaOH) or soda ash (Na2CO3). Sodium-based alkalis improve mass transfer rate when compared to calcium-based reagents. This process can be effective and economical to reduce SO2 and other airborne pollutant emissions from process plants such as ore smelters, chemical plants, refineries, paper mills, cogeneration boilers, and hazardous waste incinerators. Operating costs prevent wider use on utility boilers and other larger applications. Gypsum is not a byproduct of this process. Smaller applications often use NaOH as the sodium alkali source. A concentrated dual alkali system may also be used when flue gas sulfur levels vary widely (0.5 – 6%). This absorbent solution concentration does not precipitate gypsum during the absorbent regeneration. The system operates in an unsaturated state with respect to gypsum. A concentrated mode dual alkali plant dissolves sulfur dioxide yielding mostly NaHSO3 as a product. The solution from this absorber section is pumped to the lime reactor tank for regeneration. Slaked lime (Ca(OH)2) is added to increase the pH and precipitate CaSO3. NaHSO3 reacts to regenerate NaOH and Na2SO3. Filtrate from the vacuum dewatering filter is also returned to this tank. Sulfates in the system form CaSO4. The final product from the dual alkali plant is a mixture of CaSO3 and CaSO4 in an 80/20 ratio. Lime reactor tank effluent flows through a two stage clarification process consisting of a HiFlo™ High Rate Thickener and a Solids CONTACT CLARIFIER™. Solids are removed and all reactions are taken to completion. Sludge from these units is combined in a sludge holding tank then fed to the dewatering system. The mixture of CaSO3 and CaSO4 is filtered using a rotary vacuum drum filter to a moisture content of 30% to 40%. Caustic or soda ash feed replenishes sodium lost in the filter cake. Lime slurry replenishes calcium lost in sludge formation. Coal gasification, the conversion of coal to liquid fuel, has a long history. One innovation to the process is the addition of a combined cycle power generation system. As in the traditional combined cycle power plant, a gas turbine is used as the first means of power generation. In this case, the gas turbine is fired by the syngas of the gasification plant. The syngas is also used to heat the exhaust of the gas turbine, and this heated stream is sent to a heat recovery steam generator (HRSG). The HRSG produces steam which drives a steam turbine, generating further electricity. The waste steam from this process can be used in other parts of the coal gasification process. The syngas produced by the gasifier is scrubbed to remove sulfur and other contaminants. The gas stream then moves on for mercury removal with activated carbon. The waste stream produced by this syngas scrubber is analogous to the wastewater produced in flue gas desulfurization (FGD) at a coal-fired power plant. This is to be expected since the gasifier is “burning” coal or some other fuel source and releasing the same types of contaminants produced in a coal-fired boiler. The scrubber’s downstream flow must therefore be treated to remove heavy metals such as selenium, cadmium, and mercury, as well as other process contaminants. However, unlike FGD, there are no gypsum solids produced. The first step in the treatment process is to precipitate heavy metals. This is most commonly done through the addition of lime slurry, but depending on the size of the waste stream it can also be accomplished with the addition of caustic. In either case, the pH is raised to a level above 11 where metals precipitate as hydroxides. Further reduction of heavy metals may be achieved with organosulfide addition. This precipitates metal sulfides which have much lower solubility limits than hydroxides. This process allows mercury removal down to parts per trillion levels. The resulting pH is normalized with hydrochloric acid. Using hydrochloric acid to adjust the pH prevents the sulfide reintroduction that would accompany the use of sulfuric acid. The metal precipitates must now be removed from the waste stream. A Solids CONTACT CLARIFIER™ removes the precipitates from the now very dilute stream. The Solids CONTACT CLARIFIER™ employs an impeller which draws sludge from the tank bottom through a draft tube and into the reaction well. This impeller imparts high flow with low shear. The recycle stream is sized for 10 times the inlet flow and has a suspended solids level of 10,000 ppm. Incoming solids contact previously-flocculated and settled solids resulting in high solid removal rates. A portion of the blowdown sludge from the Solids CONTACT CLARIFIER™ is recycled to a mix tank. This promotes additional floc formation and solids removal. Sludge from the solids contact unit flows to a traditional thickener and then to a conventional dewatering process. Dewatered sludge containing mercury, metal hydroxides, and sulfides is sent to hazardous waste landfills. The combined cycle power generation portion of the plant has the same water requirements as any combined cycle power plant. The water may require pretreatment prior to ion exchange or reverse osmosis. This pretreatment can take the form of clarification and filtration or may even require lime softening. Wet flue-gas desulfurization (FGD) systems generally operate in a pH of 5.0 or above and require feed of reagent to remove sulphur. Limestone slurry is the most commonly used reagent. The quantity of slurry depends mostly on the sulfur levels in the coal. It is common for modern FGD systems to achieve 99% removal of SO2. Scrubbers not only capture the SO2, but also capture up to 98% of mercury and 99% of fine particles associated with lung problems such as asthma. This reaction produces gypsum (CaSO4) as a byproduct. The gypsum is removed either by thickeners or hydrocyclones and then dewatered. In general, gypsum is either disposed of in a landfill or sold for the manufacture of wallboard. Disposal grade gypsum typically has a specified moisture of 15%. WesTech scraper discharge filters offer a simple, yet effective, means of dewatering disposal grade FGD gypsum. Wallboard grade gypsum is specified as having less than 10% moisture. To achieve this low level of moisture, a horizontal belt filter is used. A major influence on obtaining this performance is the aspect ratio of the gypsum solids. For a square cross-sectional area and crystals of equal volume, an 8:1 aspect ratio has 35% more surface area than a 2:1 aspect ratio. So, if crystals with 2:1 aspect ratio give 10% surface moisture, 8:1 aspect ratio will give 13.5% moisture under the same filtration conditions. This is approximately what has been observed in the field. The system must start with limestone of high purity, generally greater than 95% CaCO3, which will then contribute less than 3% inert fines in the gypsum. The oxidation step is run with long residence time (for gypsum growth), high solids concentration (for low aspect ratio) and low pump shear (for low mechanical nucleation rate). Keeping fly ash out of the gypsum and using makeup water with low silt content will also produce a lower moisture filter cake. The filter must be sized accurately for the gypsum specifications. Filtration rates vary from 150 to 400 lb./hr./ft2 depending on particle size distribution and desired moisture content of cake. High feed solids concentration are required, typically 50 to 55 wt. % solids to avoid segregation of fine and coarse particles. High vacuum air flow rates of 15 to 25 cfm/ft2 are used to provide pressure drop to strip off surface moisture for 10% moisture or less. Chloride removal is accomplished by two to three wash displacements to achieve the over 90% wash efficiency for required wallboard quality. Good feed distribution is essential. Even a slight flow bias gives cake thickness variation side to side with corresponding wash and dry differences. Gypsum cake leaves a heel on the cloth. The cloth wash slurry contains about 1–2% of gypsum. This stream can be returned to the system as cake wash water. This allows the recovery of the water and the gypsum solids and reduces the total suspended solids (TSS) of the wastewater from the process. Gypsum produced from flue-gas desulfurization (FGD) has been used as a valuable byproduct which was sold as a feedstock for wallboard manufacturing. Economic trends in housing starts affect the demand and price of gypsum. There is also a trend among utilities to close waste ponds at their power plants. These combined trends have fueled the need to find alternate gypsum disposal methods. One method makes use of abandoned mine sites. This disposal method has the added advantage of neutralizing acid mine drainage (AMD). Gypsum has a high pH and can therefore neutralize AMD streams. Flue-gas desulfurization effluent is dewatered to facilitate gypsum transportation. Mine disposal decreases the required level of dewatering. Wallboard grade gypsum requires a solids level greater than 90%. Disposal grade gypsum has a solids level of 85%. Mine disposal grade gypsum must only fail to have any free liquid. This substantially reduces dewatering costs, but results in more system water loss and increased shipping weight and bulk. The gypsum is shipped to the disposal facility by barge, truck, or train and offloaded for feeding to a conveyor system. The conveyor transports the “dry” gypsum to the reclaim tank where it is mixed with water reclaimed from the process. Water may also be added to the effluent of this tank to ensure the proper solids content in the gypsum mix and storage tanks. Solids settling is prevented in the gypsum mix and storage tanks by using mixers while the other tanks are sequentially pumped to the mine. The slurry solids level is monitored to avoid slurry line plugging as well as excess water usage. Slurry barricades allow the deposited slurry to dewater via gravity. Water from this phase is collected in a mine pool then pumped to an aboveground thickener. The thickener settles excess solids while the water may be reclaimed as slurry makeup. If river water is used as makeup water, it may also be treated by the thickener. Discharge requirements for industrial wastewater are becoming stricter. Many companies are moving to zero liquid discharge (ZLD) systems. Read our blog post, Wastewater Treatment for Power Plants: Considering Zero Liquid Discharge. In the example shown in this flow sheet, water with high total dissolved solids (TDS) is treated before it is sent to a crystallizer. Crystallization is an evaporation process that creates a pure water distillate that can be sent back to the process. The remaining dissolved solids form crystals that can be removed and sent for disposal or used for something like road salt. The pretreatment process protects the crystallizer and the reverse osmosis filtration system by removing material that could harm them. The pretreatment includes three major steps: cold lime softening, filtration, and sludge treatment. Softening is the removal of elements in the water like calcium, magnesium, and silica that could cause fouling or scaling of reverse osmosis or crystallizer equipment. Softening begins with chemical addition. Coagulant and polymer improve the clarification process by encouraging individual particles to form fast settling clusters of particles. The Solids CONTACT CLARIFIERTM softener provides a reaction zone for the removal of hardness. Lime and soda ash are added in the reaction zone just before the feed water. Coagulant (when necessary) allows particles to come together. Polymer helps individual particles form large, fast-settling clusters. Lime is added to increase the pH to remove calcium and magnesium hardness. Soda ash is added (when necessary) to remove calcium hardness. Internally recirculated solids react with lime and soda ash and form heavy faster settling particles. The sludge is scraped to the center and removed for dewatering. Acid is added to the softened water to stop the softening reaction. The pH is lowered to less than 8. Usually hydrochloric acid is used because it doesn’t add sulfates that could form gypsum scale in the reverse osmosis and crystallization processes. Three stages of filtration are used; each provides pretreatment to the next. The dual media filters and ultrafiltration system remove any remaining solid particles. The backwash water is recycled back to the clarifier. Reverse osmosis removes the dissolved solids from the water. The treated water is sent back to the process. The concentrated dissolved solids stream is sent to the crystallizer. The underflow of the Solids CONTACT CLARIFIERTM is pumped into a thickener. Polymer may be added to improve settling and clarity. The thickener increases the concentration of the sludge. The overflow is sent back to the clarifier. The thickened underflow is sent to a filter press or other type of vacuum or pressure dewatering filter. In the filter press the water is forced out of the sludge under pressure. It may require additional polymer to function properly. The cake is then hauled off for disposal. The pressate and any wash water get pumped to the reclaim water storage sump with the backwash from the filtration systems and then it is recycled back into the clarifier.